Green Fairy Quilts: Awesome Giveaway!!!!!! So - since I am totally lame and missed my 200th post (big deal right?) I have decided that I will use my 205th post for a fabulous or "Awesome" giveaway. What's up for grabs? 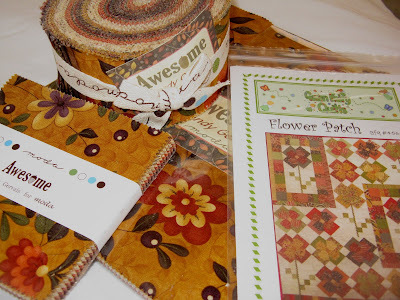 Well, a layer cake, jelly roll, charm pack and my pattern "Flower Patch." All four things will go to a lucky winner. I do have a couple requests though, since I feel I am giving something so totally "Awesome" - love the play on the name - Did I mention the fabric line is "Awesome" by Sandy Gervais? - one of my favorite Moda designers. Go to our "See What's Coming Soon" page and tell me what product you can't wait to get your hands on. Next - go anywhere on my website and tell me what you love that you can get now in my available inventory. So - two answers and you are entered into my giveaway. Simple as that. But, if you want more entries, like five - blog, facebook, twitter etc... about my giveaway (be sure to tell me you did because I hate to count) and you will get more entries. Oh, and follow me because I love followers! Good luck, you have until Thursday night when I announce the winner. What a wonderful giveaway. How generous of you! I love the Saltbox Harvest fat quarters in your coming soon section. The Happy Daisy layer cake is my favorite on your website. Truly is an Awesome giveaway. Thanks for the chance. Coming soon: 'Happy' Jelly Roll. Can't wait to get some yardage of the Half Moon line of fabric. It's yummy! Thanks for hosting such a generous giveaway and congrats on 205 posts! Very generous and a fantastic prize! I am looking forward to the Luna Notte Jelly Roll and I am ogling the 12 days of Christmas fat quarter bundle right now. Congratulations on over 200 posts....here's to the next 200!!! I love Fangango in your "coming soon" category. It was very hard to chose just one!! In your current inventory I can't go past Lumiere de Noel. That fabric sings to me. I have been a follower for quite a while. Great giveaway - thanks for giving us a chance! My favorite coming attraction is the Saltbox Harvest FQ Bundle. For what's available now, I really like the Wrapped in Paisley Layer Cake. I would love to have some of the Breakfast at Tiffany's and I'm really liking Park Ave. for a nice cozy winter/fall quilt. I love the pattern you are giving away. I saw it make up in Oz at Scrap Apple this Spring. Fun giveaway! #1 I am a follower. What I love that is in stock now is Frolic by Sabdy G. And what's coming... oh so many! Bliss is top of my list, Origins by Basic Grey and 1/2 Moon is really cool! And I'm a follower too! I would love the "origins." Love it!! Like so so so much. I would choose the Awesome, because it is. Ohhh, that is such a great and generous give-away, I just have to write :-)). 501st!!WIW. But you were already in my Reader and I'm getting your newsletter, does that mean I am a triple follower now? LOL. I haven't updated my blog in a long long time, so I deleted it, sorry, can't blog about this give-away and don't do facebook or Twitter, too bad. (it is a bit mean though to have us drool over all those lovely fabrics :-) ), I like the Rural Jardin jellyroll, because I have the Rouenneries honeybunn and some yardage, they would go wonderfully together. I am a follower and admirer. What a great fun prize to win! Thanks for the chance. I would love to get my hands on a Fat Quarter Bundle of Bliss. I love most all the fabrics in the 12 Days of Christmas, charm packs are quite addicting! I am excited for bliss!!! And Wee Woodland! Of the current fabrics I love Boutique!!! What can't I wait for???? BLISS. What do I love? Lumiere de Noel. Thanks for an "awesome" giveaway!!! WOW, that Arnold's Attic looks like MY kinda fabric so I'd probably hafta get either a couple of charm packs or a jelly roll. And I MUST have that adorable Flower Patch pattern..TOO CUTE! Thanks for the great giveaway! I'm on a layer cake kick....so I'd love to get my hands on a Fandango layer cake. As far as what you've got on hand--I love the Fruitcake layer cake. Do I get a second entry for following your blog...did I read that right? Happy Campers by American Jane- I have been wanting to do something fun in our camper and this might be it! Thanks for such a fun giveaway! I do follow too! My favorites are Happy and Awesome. I am wanting to do a jelly roll quilt next. Thanks. I am a faithful follower. I love your blog. The "Summer's End" fat quarter bundle or jelly roll would be awesome in a quilt top that I have waiting in the wings to be pieced. I haven't been able to decide on fabric for it until now! I can't believe how much you have to choose from here! In what I could get now I really like the line "Essence" by Sandy Gervais. These are the colors that I love to work with. I just need to work a little harder to get some spare cash, lol! What an awesome give-away you have going. Oh, and I'm a follower so if I added right this gives me three entries. P.S. Just saw a comment and didn't know I needed to put this (must have missed it in the rules) but yes, I'm a customer too, four entries for me, woohoo! Ok, so those Lollipop pre-cuts are pretty awesome looking and I would love to get my hands on them. And Makin New Friends looks like some nice fabric to keep my mind off the heat! Now off to facebook and twitter! Hope all is well with you, Judi, and you're not suffering too much in the summer heat! Okay, in the coming soon items I love the punctuation line! Too cute! And Bliss is on my list of Gotta haves, and I also love the Breakfast at Tiffany's...So many pretties! In the available now, I would get the square chase and the turtle walk patterns. and twittered, or tweeted, or whatever it's called! Still haven't figured out Twitter! Thanks for a fun prize. Awesome is the word for your generous give away. From the new arrivals I loved Lumiere Noel. From the soon to come I love Haunted House Mansion and Halloween Night Charm Pack. I also posted your give away on my blog. I must be getting sentimental as I am looking at your xmas fabric--I like "Luna Notte" and Christmas Magic". Thanks for the great giveaway! PS I love how you did "Paula's Quilt"
This is a wonderful giveaway. Thanks for sharing. Just love the Luna Notte fabric and probably layer cakes of Park Avenue on the website. Although it's really hard to make a decision - they all look wonderful. Coming Soon - Prayer Flag..pretty!!! Oh yeah, I follow you, you are in my blog feed! Coming soon I have to have the Pure fat quarters. I love words on fabric. Right now I could get the Tweet Tweet jelly roll. I became a follower on Gmail and Facebook. So that adds up to 4 entries for your Awesome prize! Also I am a follower. What a wonderful giveaway! What would I like that's not available? The Lolloipop fabric is quite cute - I'd take any cut of that one! As for available now, I really like the Make Life fabric - again, any cut will do; the bigger the better! Oh my... so many to choose from. Both are so out of my norm... I need to diversify. I just blogged about your giveaway as well. I would love to have a Haunted Mansion jelly roll and the Strip This Quilt quilt pattern. So cute! It's very hard to choose just one. I think I'd love to get Bliss and make a 'girly' quilt as I live in a house of boys! I will go with "Bliss" on the coming soon and Lumiere by French General. bliss is the name of my father's boat...and cute fabric too. Coming soon; I love Bliss and Punctuation and currently available I love the My Bags are Packed pattern. Wow! It is so generous of you to offer a giveaway like this. I can't wait to get me hands on ... Collection for a cause - Hope. I also love ...Lumiere de Noel by French General, out of your current inventory. Thanks for including me. Wow! A really awesome giveaway!! In the upcoming stuff, I like Fandango, Evening Mist, and Lily & Will. In your store stock, I love Cherish Nature!! And I'm already a follower!! I can't wait to get Origins!!! Those colors are just wonderful! Fruit Cake and Happy Daisy are on my list! I am a follower now and from the coming soon I like Pure. From the now available, I like the Make Life jelly roll. I can't wait to get a Happy Layer Cake!!! SO CUTE! I would love to buy a Frolic Charm Pack. I love that fabric. I'm looking forward to: Fandango. It's so happy looking! I'd love to get: Happy Daisy. I love the owl and ladybug! I'm pretty pumped about Pure by Sweetwater hitting the shelves. And if I wasn't so cheap I'd totally by myself some Lumiere de Noel by French General. Thanks for the giveaway! Ohhhh, so many pretty lines coming out and I keep saying 'oh THAT one!' but then I see another I want. I absolutely love the "pure, the Bliss and the Origins fabric lines, and it would not matter if it was a charm, layer cake, or what! I am a follower too! I can't wait to get my hands on Breakfast at Tiffanys' or Origins - both fabulous!!! Gotta say that I love the Lumiere de Noel. I have been a long time follower of your fabulous work. Oh Judi how fun!!!! This is a wonderful give-a-way. I have to tell you that I love Sandy's fabric also she is one of the 2 at the top of my list. What I would love to have that is Moda Layer Cake - Lumiere de Noel by French General, yum, yum and your snowman pattern and of course the gorgeous Sandi fabrics....I just cannot pick which one. I also love your flower pattern, oh I just cannot pick just one. The question should have been what do you not like....then the answers would have been short. Thanks Judi for the wonderful give-a-way. I just love Moda fabrics! Love to get: butterfly mania quilt pattern! take care and do something special for you.. I can't wait to get my hands on a Lollipop Fat Quarter Bundle! Happy 200th (205th) post. Congratulations. And I'd love to have Breakfast at Tiffany's with you, on a roll. Just delightful! I love Origins in the coming soon category. I really need some more superior thread too. And that Moda Fat Quarter Bundle - Lumiere de Noel by French General that you currently have in your store looks awesome. Your Moda Dessert Roll - Aster Manor by 3 Sisters has certainly caught my attention. Would help make a beautiful quilt. Yumm. I just tweeted about your Awesome Giveaway! What an awesome giveaway, thanks for the chance to win! I'd love to get a FQ bundle of Awesome or Pure when it becomes available. Right now I'm thinking I need to get my hands on the Checkered Flowers pattern & the Strip this Quilt pattern. How can I choose?? Oh my gosh!! I love all the new fabric coming out. If I had to choose just one I would pick Fandango. I have my eye on your Whimsy Layer Cake. Yummmy!!! I am already a follower and I will tweet! Can't wait for the Bliss! And then I love the Boutique by Chez Moi! WEll, I THOUGHT this would be easy but no, it wasn't. oh, so many scrumptious new lines! Coming soon--actually, I'd like a PURE LAYER CAKE to make a quilt for my aunt. those are her colors and she's a voracious reader so she'll adore the words! Right now--I love the quilted bag pattern! Love the Half Moon Fat quarters bundle in you coming soon, and the Objects of Desire by Sandy Gervais Honey buns, in the inventory section. Wow love the Fandango fat quarter bundle! adoring by sandy gervais...i want it!!!! OMG, I love Sandy Gervais and I love the Awesome fabric line! I'd love to win this giveaway. As to the "coming soon" items, I'd have to say Bliss is at the top of the list, followed closely by Pure and Spirit. For existing products, I'd love a Boutique layer cake or two. So Lets just keep my fingers crossed for a big win... but even if I don't, you know I'll be back... and soon lol! I love the Haunted Mansion jelly roll from the what's coming soon section, and from available inventory I love the Whimsy jelly roll! Coming soon faves: Bliss, Fandango, Prayer Flag, and Origins. Sorry - there's no way I can just pick one at this time of year!! Oh, this is hard - On the coming soon page - I really love the Evening Mist charm pack; and the Pure line from Moda. I do think I will have to buy some of that, just need to find the pattern first, so I'm sure I purchase the correct amount and cuts. What's available now that I love? - The Moda Jelly Roll - Cherish Nature by Deb Strain. I may be back to order that. Hmmm, really, really love it. Hands down "makin New Friends"
is enchanting. Memories of childhood, you can't beat that! In the coming soon category -Happy! looks so very happy. Currently, I love Moda's Fruitcake. And I am a follower. Favorites available now: I still need to pick up some Botany prints - maybe a jelly roll? And I'd love to have some Whimsy fabric, too! Congratulations on 200+ blog posts! Coming soon - I thought Fandango, but then I saw Pure. Two totally different looks but both so appealing... and I've just ordered some charm packs but Fruitcake has just caught my eye - sigh - so many great fabrics - so little sewing time... and I'm already a long-time follower... have fun with your giveaway! I would love to have the Half Moon Fat Quarter bundle when it's available. And for the stuff that's available now I would love to have the Moda Fat Quarter Bundle - Me & My Sister Favorites. From the coming soon I'm totally in love with what Origins looks like, from the website I'm lovin Happy Daisy. I'm a follower and I've already been receiving your newsletter. You have a really good shop! Thanks Judi for this awesome giveaway! I love "Luna lotte" by 3 sisters to come, and love "Park Avenue". I also posted on FB, my blog, and twitter!! Oh my goodness! WHERE have you been hiding all my blogging life???? 1st---WOWOWOWOWOWOW! What an amazing giveaway! Count me in! 2nd---WOWOWOWOWOWOWOW! I got lost without a drool rag while off perusing your "What's coming soon" page: Which, BTW....Fandango Fat Quarter Bundle!!!! I'm waiting for Bliss!!! Right now, I'd love My Bags Are Packed. I know that sounds like I mentioned the first thing I saw on the first page of the website. I went all through the site, but that pattern is my favorite!!! Yea..awesome giveaway!! I am a follower, can't wait for Bliss and love your Garden Party pattern is awesomely cute. Thanks for the chance to win your fun pattern and fabs to go with it. Coming soon~ Bliss or Half Moon. I'm looking forward to Fandango and like the current Rural Jardin jelly roll. Thank you!! Hi again1 I am also a follower!!! the haunted mansion charm pack is adorable! Ohh what a great and generous give-away. There are so many fabrics and patterns to choose from. I can´t wait for the Wee Woodland Jelly Roll and the Happy Layer Cake, just love those happy bright fabrics. I love the Garden Party Quilt Pattern and Sail Away Quilt Pattern. The Eden fabric from Moda is also adorable. I can't wait for Breakfast at Tiffany's.... and "My Bags are Packed"
Congratulations on 205 posts!! Thank you for the chance to win! I'm loving the Fandango fabric. Hi Judi, I loved your Coming Soon Section, I really want all but I loved Pure Fat Quarter Bundle, it is fantastic. I love your shop and I'm your Facebook. Today is my birthday, I really want this giveaway !! Sorry but I'm here again, I loved "Park Avenue Fat Quarter Bundle by 3 Sisters for Moda Fabrics", all fabrics are so pretty, so inspirational. Thanks for a truly awesome giveaway! here are my favourites..
Great giveaway - adore Moda fabrics. I can't wait to get my hands on the Fandango Jelly Roll and Layer Cake. What I would love right now is some more Superior threads. thank for this truly AWESOME giveaway! wee woodland and happy daisy. and now i'm a follower too! What a treat looking at fabric in your shop! In the what's coming section, I began drooling over Maison de Garance. I love all fabric by French General. I went staight to the jelly roll section in your what's here part of the store, I loved Awesome. I've never made a Halloween quilt. I've begun "thinking" and planning a quilt for this Halloween.Love the colors in this line! Thanks for the opportunity to win! Have a great day! This is great! I am a follower. Coming soon: "Pure" Looks like a lot of fun! Now: I really do like "Awesome". Gosh: so many choices, but Happy is awesome and so is Bliss. Since I not only follow, but have purchased a couple of times...this is an awesome give away. You sure have added a lot of fabrics for the coming season. For future purchase: PURE. For what is currently available, I'm attracted to Me and My Sister. The colors are so bright and cheerful. Thanks! Oh the Happy Daisy is lovely!!!! Wow, that is a truly Awesome giveaway. I so have my fingers crossed. For currently available I think the Love U Project kit is so adorable. For soon coming, the Pure Fat Quarter kit. So perfect! I would love to have something from the lolipops collection. They look so bright and fun! I would also like the frolic FQ bundle of 7!!! Lastly, I have put it on my facebook page and my blog! Thanks Judi! I would SO love to have the AWESOME collection! Oh, I like It's a Hoot and Fruitcake. Great giveaway! for the new and upcoming...I love Bliss and City Weekend! Oh so many to choose from!!! I couldn't pick just one favorite. . either Fandango FQ bundle or Origins FQ bundle. Definitely love Froggie Goes A Courtin'. . . what a fun quilt. I am now a follower in my Google reader! From your inventory I think I'd get the 12 days of Christmas FQ bundle, I love those bundles, they are awesome. Thanks for the giveaway!! Wow, this *is* an awesome giveaway! I like your Flower Patch pattern and the fabrics are awesome, too! It's hard to pick a favorite, but from the Coming Soon, I would have to say a Bliss FQ bundle, and from available now, I'd say a Fruitcake FQ bundle. Thanks for the opportunity to win! I love Fandango, and would love to get my hands on that. As for what is available now, I love Frolic. I meant to add that I subscribe to your blog feed on Bloglines, too. I love the Pure Moda line. I can't wait to get that! Right now Make Life is my favorite but I can't wait to see Luna Notte and Maison De Garance. Thanks for the give away. LOVE LOVE LOVE this Give Away!! Coming Soon- Kashmir V and Breakfast at Tiffany's...sorry it was a tie!! In Stock- Christmas Magic and Saltbox...I can NEVER make up my mind!! Thanks - that was like going shopping first thing in the morning!! Loved it! Take care and Thanks for the chance to win your lovely prize!! Very cool giveaway! I'm really excited about Fandango. As for what you have in stock now, Botany is my fave. Next, I think the Awsome line is just....awsome.I love the rich colors and patterns! I can hardly wait for Bliss - simply beautiful ! @ and I currently love Make Life by Sweetwater ! Coming Soon - Fandango! Love love love it! Currently Want - Park Avenue Fat Quarter Bundle! Thanks for the chance at the give-away!!! I can't wait for the It's a Hoot fabric. Owls couldn't be cuter right now! I need to get your Garden Party pattern. I have blogged about your contest and I am a follower. The Fandango Fat Quarter bundle would be perfect for a quilt I want to make! Coming soon would be "Origins" cause it rocks. Then it would be "Awesome"! Thanks for this great giveaway! AWESOME IS THE WORD ALRIGHT! LOVE THIS FABRIC! WHAT A GENEROUS GIVEAWAY,JUDI! I cant wait to get my hands on some of the half moon FQ's. I love that you have frolic in stock, it's one of my favorites. Can't wait for Pure, Dream On, It's a Hoot and Fandango, and love your pattern "My Bags are Packed!" My current fav-- Fresh Cottons. I follow with your RSS feed. Can't wait to get my hands on the Origin fabric line. that was hard to choose since there are so many great fabrics coming soon. What I need now is some OZ for the back of a quilt that I am currently working on so I will be back to order soon. That fandango set in the coming soon section is to die for - I've got my eye on that! In your currently availables, 12 days of Christmas definitely caught my eye! It's impossible to choose just one thing from the coming soon page! I think I'd have to go with the "Happy" fat quarter bundle. From your current stock, I think it would be Park Avenue by 3 Sisters. I love the Moda fabrics! I also Tweeted about it (I'm QuiltinRedhead), followed your blog, and mentioned it on Facebook. You made the VERY difficult to answer! LOL! I guess, since I HAVE to pick one new item, that it would be the HAPPY layer cake or fat quarter bundle. I love the bright colors! My favorite that's available now, I guess would be Saltbox Harvest, although it's still really hard to just pick one! I'm officially following you, although I've been getting your newsletters and stuff for a while. Love your shop, and your quilting! I love so many of the coming soon fabric it's hard to choose. I have been waiting for Pure by Sweetwater and also Bliss fabric to come out. What you have now I love Martinique but also Make life. So much fabric so little time. I love the Halloween packs(all of them!) and the its a hoot !! I cant pick just one !! The Fandango line looks awesome... and I'm also looking at Half Moon - I need more black and white fabrics for my stash. Is the whole line black and white? I'm already a follower of your blog on google RSS. For what's coming soon...I like the Bliss and the Fandango Jelly Rolls by Moda. For the current shop I like the Arcadia Honey Bun. anything by momo is great I love the patterns !!! My fingers are itching to get ahold of anything in the Pure line - looks like so much fun!